Crosstown Heating & Ventilating (Calgary) Ltd. is a commercial / industrial sheet metal contractor with a complete fabrication facility located in the City of Calgary. Incorporated on June 1, 1973, the company has completed projects in Alberta, Saskatchewan, British Columbia and The Northwest Territories. Sheet metal fabrication is performed in-house which allows for complete quality control and scheduling of the work. The plant and storage yard are served by two Ten ton, seventy foot wide overhead cranes which assist in material handling. Software developed by Shop Data Systems of Garland, Texas and all required sheet metal machinery are in place to produce a quality product at a competitive price. Our commitment is to provide Quality, Service and Dependability to our clients. 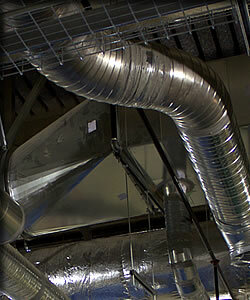 Ductwork co-ordination drawings are produced on a CAD system. The drawings assist in eliminating potential conflicts between the ductwork, building structure and other trades. Estimates provide detailed audit trails of all required materials and labour. Our service department is on call 24 hours a day to respond to our customers needs. The technicians are trained to service and repair the entire array of HVAC equipment.